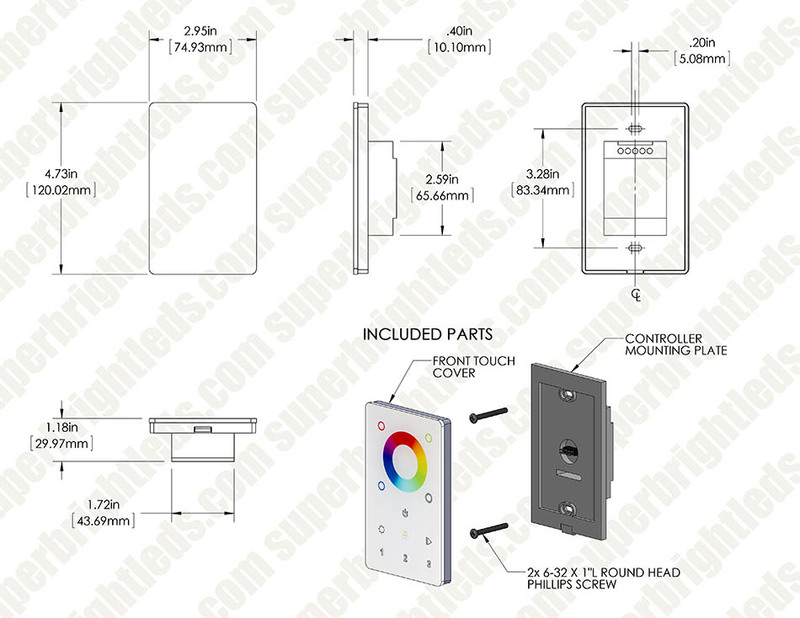 Wireless RGBW Touch LED Dimmer Switch for EZ Dimmer Controller: 360° View. 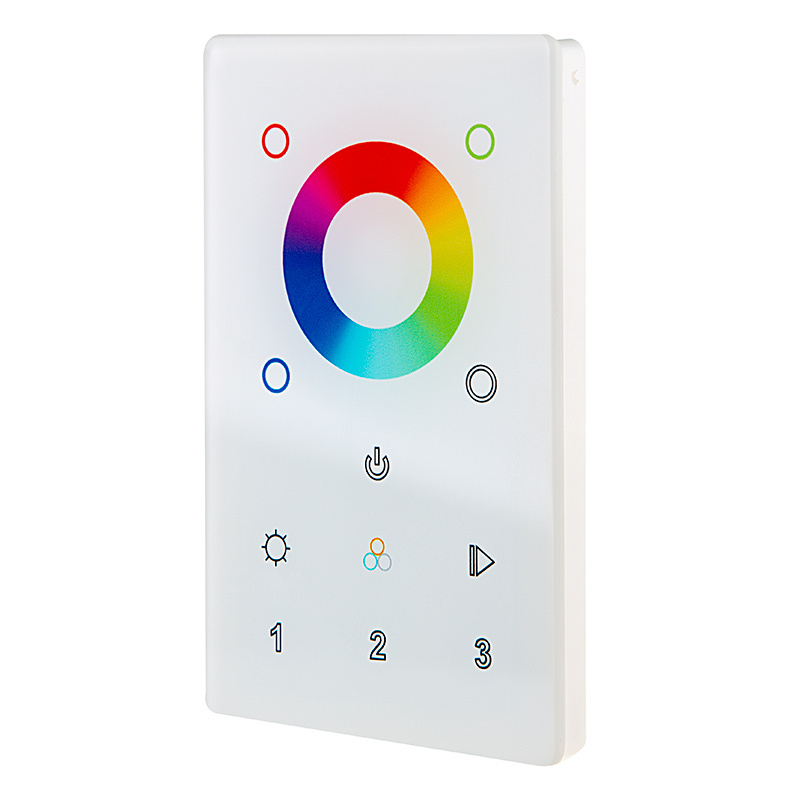 Designed for use with the Wireless LED 4-Channel EZ Dimmer Receiver and as a DMX controller, this wireless RGBW LED dimmer switch fits in standard wall switch boxes and provides on/off control as well as fixed levels of dimmability. 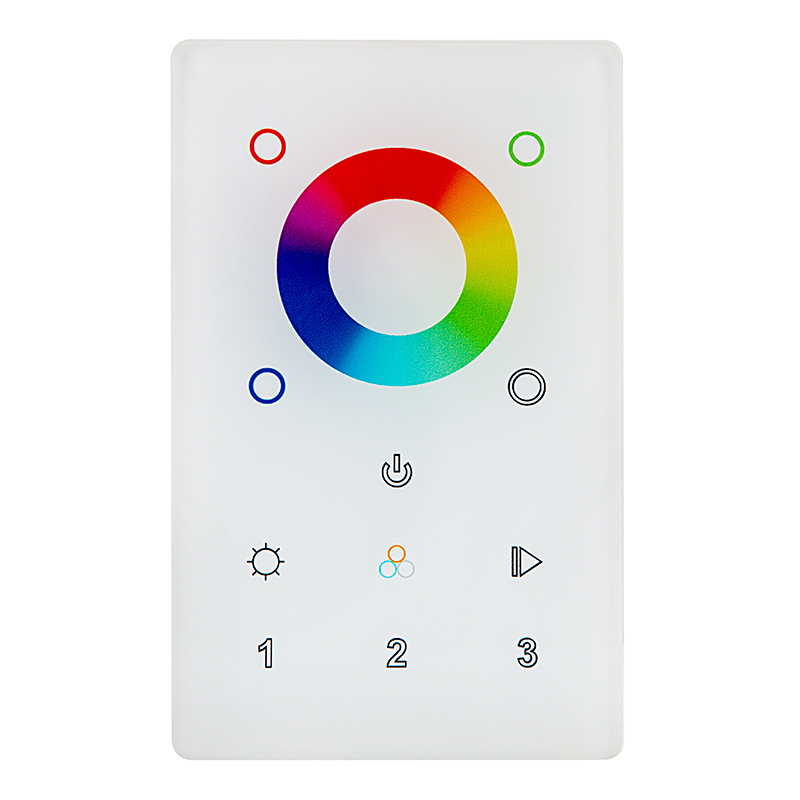 The dimmer switch has a color-selection wheel for thousands of color options, 10 dynamic color-changing/single color modes, 0-100% dimming, on/off controls, and 4 color-specific channel controls for red, green, blue, and white. 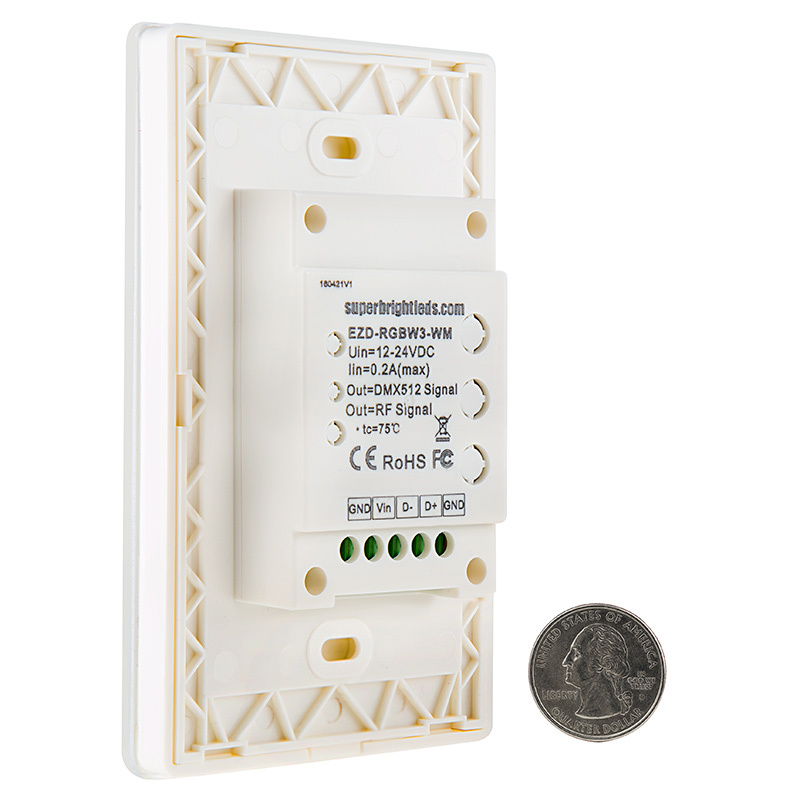 The dimmer transmits an RF signal to the wireless receiver from up to 300' away in open air. The wireless dimmer includes 2 mounting screws. Follow illustrated steps in the instruction sheet to connect Wall Switch to Power Supply. Connect GND terminal to negative and connect VIn to positive from power supply. Using a small flathead screwdriver, loosen the labeled terminal screws visible on the top of the controller. Matching light strip wires with labeled slots on the Controller, insert wires and tighten terminal screws. Be sure wire conductor, not wire insulation, is secured in terminal. Release Wall Switch control panel from Back Plate by separating at notch on bottom of Wall Switch and pivoting away from locking tabs on top of Wall Switch. Connect the wiring from the Wall Switch to the Power Supply as the diagram shown to the right. 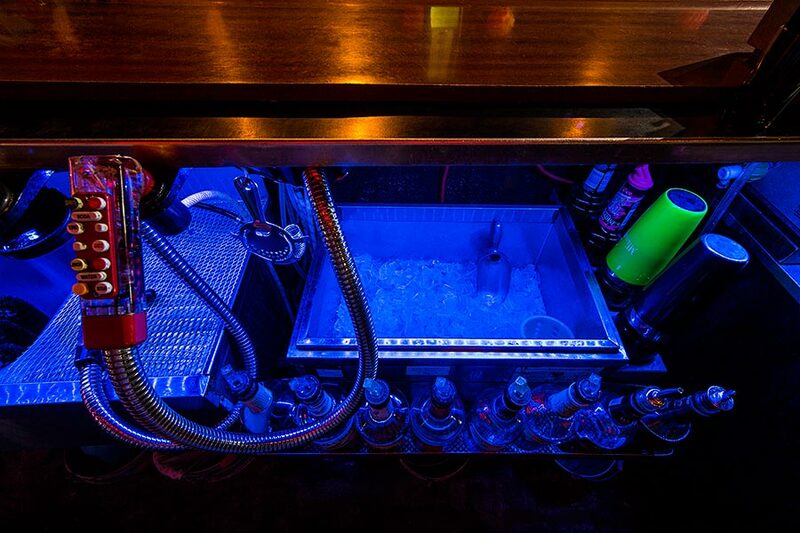 Optionally, connect wired DMX control signal to DMX controllers. 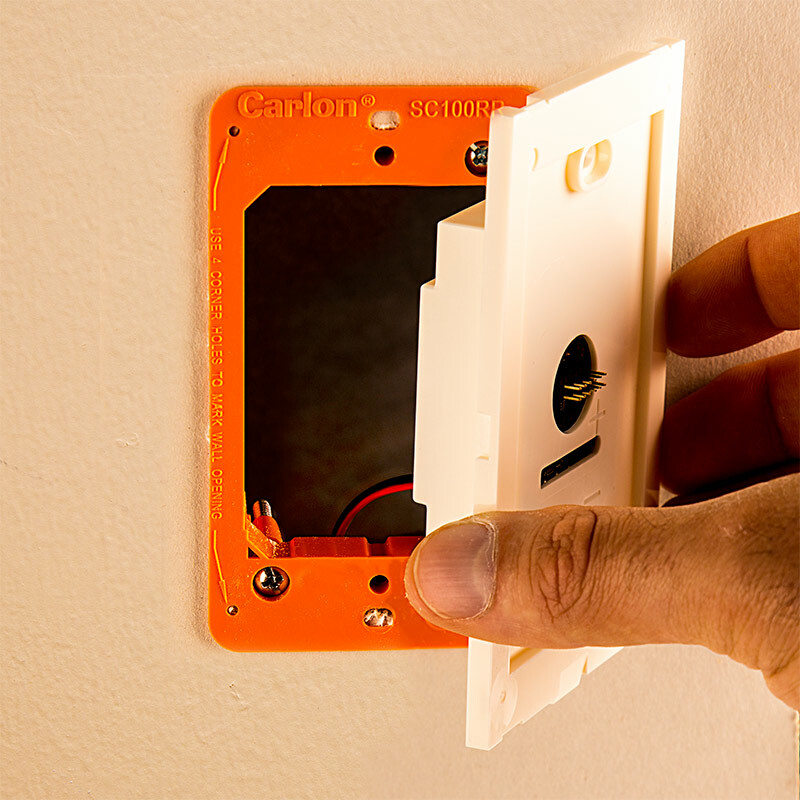 Fasten wall switch to existing switch box using supplied Screws. Align locking tabs on top of Wall Switch Control Panel to Back Plate and pivot Control panel towards Back Plate being sure all locking tabs engage fully. 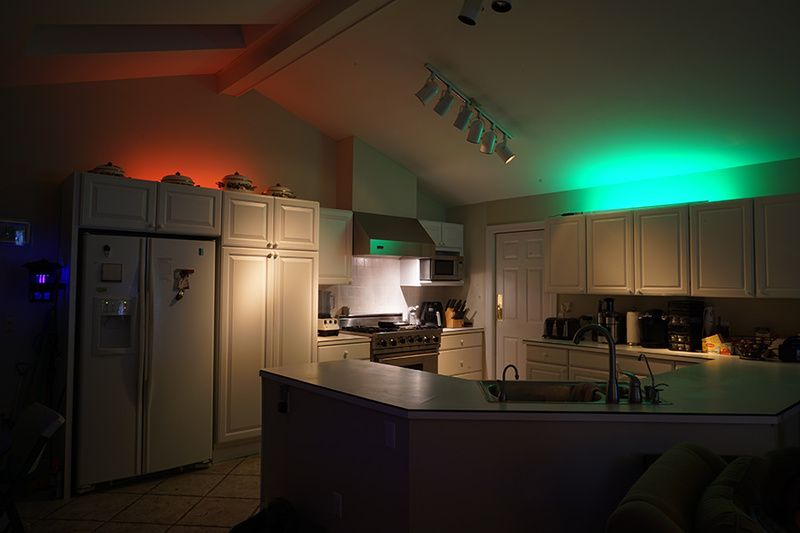 RGBW LED Strip Lights - Dual Row 24V LED Tape Light w/ White and Multicolor LEDs - 530 Lumens/ft.